Not being particularly adept at identifying insects, I believe this damselfly photographed along Ash Creek (Lassen County CA) is a female American rubyspot (Hetaerina americana). The female of this species has light eyes, a coppery to very dark green top to the abdomen and thoracic striping. The wing patches, red in the male, are orangish in the female American rubyspot. This common damselfly can be found around streams and rivers. 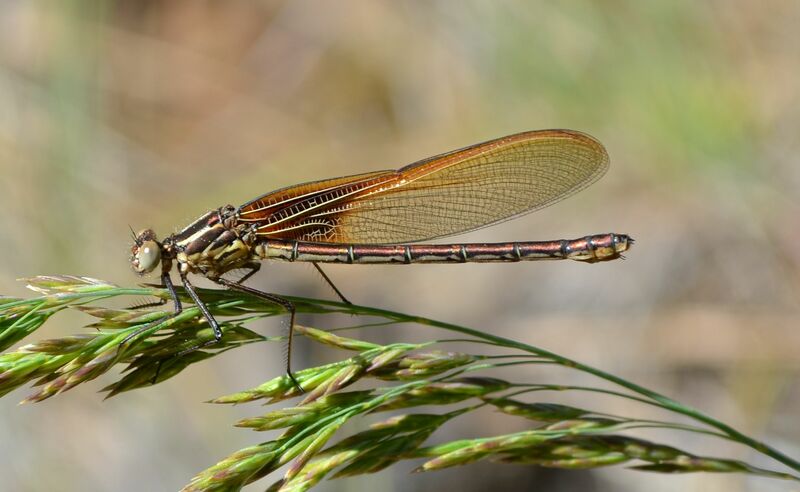 This entry was posted in damselfly, Insects and tagged American rubyspot, damselfly, Hetaerina americana, nature photography. Bookmark the permalink. Gorgeous shot of a beautiful damselfy. So many of the ones that I see are blue, which makes this one stand out even more. Thanks, Mike. Like you, many of our male damselflies are also blue – and very difficult to distinguish.